I thought we were ready for all contingencies as we prepared ourselves, the design, the plans, the permits and the site. I was even prepared to deal with the half-load restrictions imposed to protect thawing roadbeds early in spring, which is when we started our work. So what was left to catch me off guard? Parking. I mentioned this subject in passing in the first article, and I have to say I was stunned by how important finding places to put vehicles became – and how contentious it could get. In our role as the watershape contractors, we marched in and pumped more than 1,200 cubic yards of concrete and accepted delivery of three tractor-trailer loads of rebar and countless loads of gravel and topsoil, and we needed our space. Landscape crews were all around us, planting thousands of trees and shrubs – much of that material delivered early and installed right away to eliminate stockpiling. This meant bringing in a crane to move trees and even bucket-loads of topsoil to spots down the slope from our place atop the cliff. All of this furious activity was happening at once, it seemed – and there was basically nowhere to park but the street, which was no more than a narrow, two-lane gravel road. And this was just one of the issues that faced us as we moved further along in the process of shaping the grounds of this estate cottage. With traffic comes noise and congestion and diesel odors and enough else by way of disruption that the neighbors pretty much all hated us. The daily traffic on and off the site was so staggering that we ended up installed portable traffic lights to manage access when the gravel road shrank to one lane to accommodate all of the delivery trucks, concrete trucks, dump trucks, trash bins and personal crew vehicles that needed parking places. As you might imagine, all of this traffic translated to a crowded work site, with every inch of space taken up by tradespeople of all sorts; by heaps of equipment and materials; and by actual work activity as we all moved along. At times, it looked like an anthill: We weren’t actually climbing up and over each other, but there were times when it almost seemed like it might have saved time to give it a try. So there we all were, working on a clifftop in the beautiful Muskoka district of Ontario, Canada, briefly refreshing ourselves from time to time by drinking in the views of the lake 130 feet below us and the craggy hills all around. And for the most part, I guess we were worker ants, moving through tasks as efficiently as we could despite the extremely crowded working conditions. Give the project’s scale, it’s unusually helpful to look at some aerial photographs to get a fuller sense of the lay of the land atop a slop above a serene, picturesque landscape. The pool complex cut deeply into the bedrock so there would be usable space beneath it. On the other side of the cottage, the sports court is on a higher level, towering over the boat dock and deck more than 100 feet below it. This situation called for constant communication among all of the major trades on site. In fact, there were daily meetings between the home builder, our company (Poolscape, based in Toronto) and the landscape crews. I credit these brief sessions with preventing wars from developing on site. But even so, it was not all smooth sailing. For our part, we were under tremendous pressure to complete all of the structural concrete work in a very condensed time frame. We were also responsible for installing miles of embedded conduits for use by various other sub-trades following behind us. Gantt charts were used start to finish as an overall project guide as the trades all hammered out the processes that helped us make progress. Pushing things along, the long-distance firms that came in for the project (ours among them) made a special point of relying whenever possible on local consultants and subcontractors with Muskoka knowledge and experience. The soils engineer, for example, was very familiar with the special conditions that came with our site, and his advice proved invaluable when it came to pinning our structural concrete into the solid granite bedrock. For his part, the nearby surveyor came to the site weekly, shooting a few lines to make certain everything was on the right grade in the right location. The locally based blasting contractor came in and brought back all of the crushed stone we’d generated in clearing away the granite hilltop (and had stored at a location a couple hundred yards away on the estate grounds) as well as countless loads of topsoil required for the project. A few stellar local tradespeople worked on the project, but for the most part the skilled trades were based in Toronto or even farther afield: The local market simply did not have the technical abilities or required volume of personnel to handle a project on this scale within a narrow time frame. But handle it we all did – including some parts of the project executed in awful weather. The Ipé dock’s framework, for example, was completed in the throes of a foul Canadian winter. It had to be done then, because lakeside access is restricted during the summer both by environmental considerations and the steep grade. As the winter temperatures froze the lake’s surface, it was possible to bring construction equipment over the ice to place the steel pilings into the lake bed below. The dock itself was completed in milder spring weather. 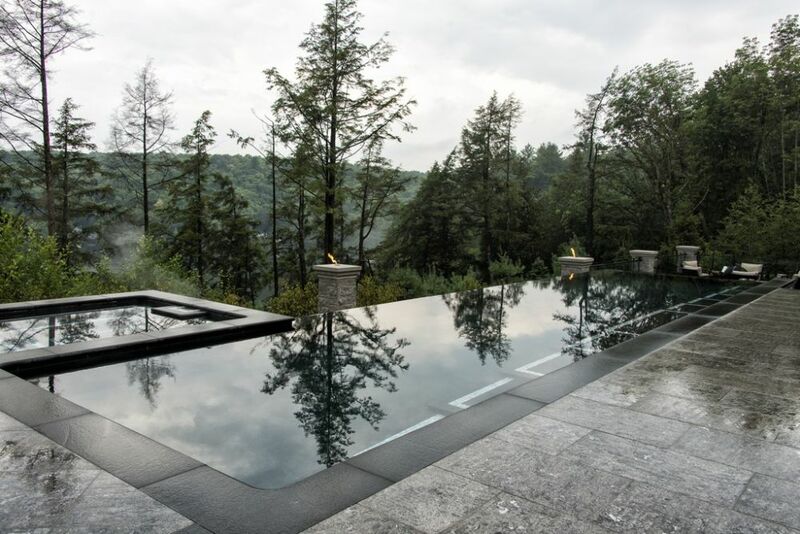 On top of the cliff, we built a cast-in-place pool, spa and shallow lounging area, suspending them over a concrete mechanical bunker that included both a below-grade entertainment space and a service area. For their part, the concrete decks surrounding the big cottage were cantilevered over the cliff, offering spectacular view of the lake and surrounding terrain. 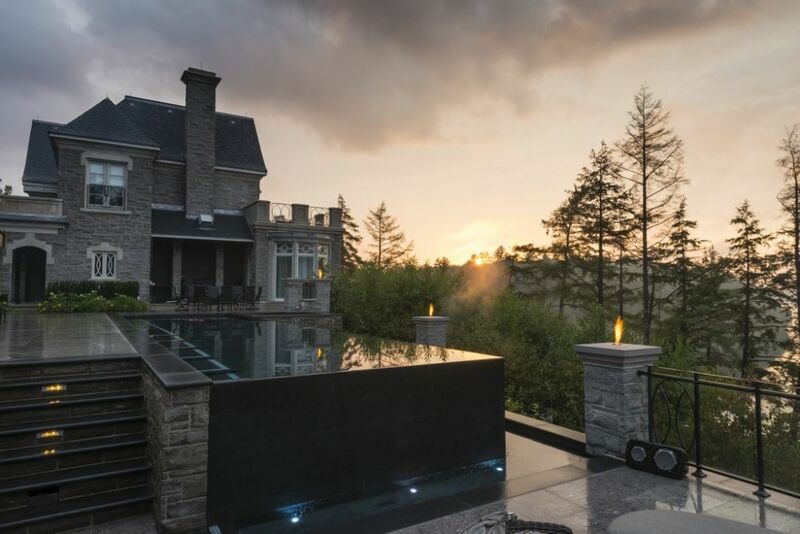 The long, dramatic granite pathway alongside the cottage ultimately leads over to the granite pool deck, a large vanishing-edge swimming pool and a stand-up spa – both wrapped in granite. 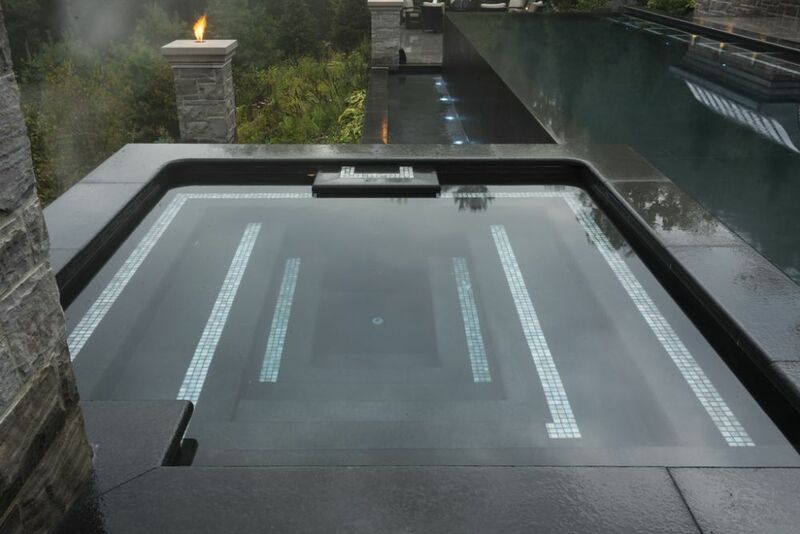 The spa is designed and intended for year-round use by the homeowners and their guests. The pool, spa and lounging area as well as all of the concrete decks were tiled with granite, and the sports court (a late project addition) was placed 45 feet above the granite cliff sloping down to the lake below. The added structure was placed atop an eight-car garage. 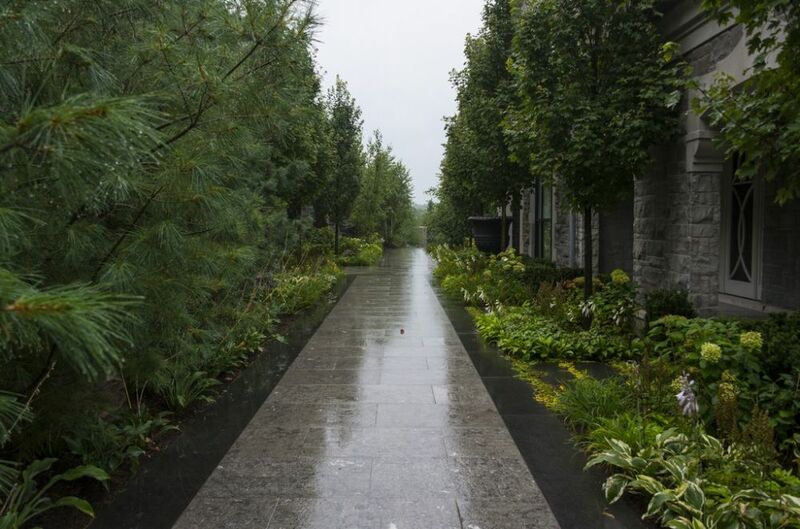 And all around the property, landscape crews draped the balance of the space with native trees and plants, walkways, gates and a large concrete driveway. Safety was always an issue. Much of our part of the project was constructed after large shelves had been blasted out of the cliff’s granite bedrock. Our crews, working while exposed over the lake, wore harnesses as they pinned the footings into the granite – and while they were working on the outer fringes of the structures we built above the shelves. 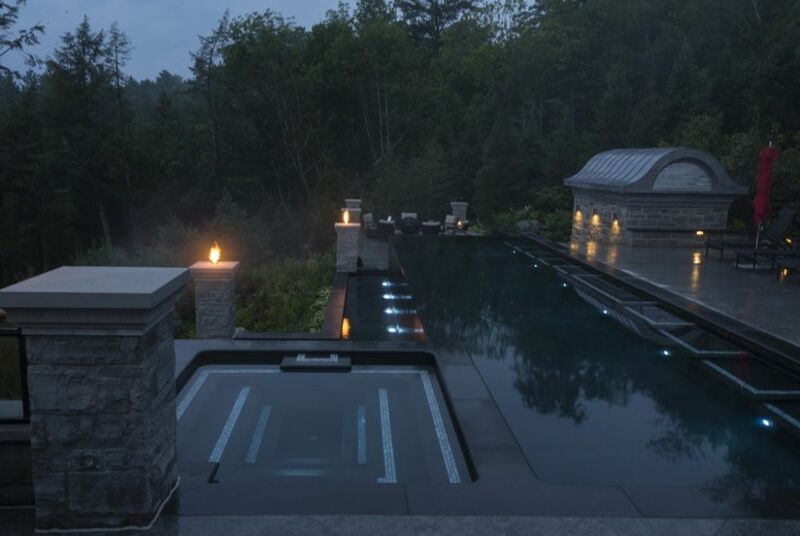 Avoiding long-term winter damage was another goal: The pool, spa and bunker were designed to be heated with a large and highly efficient propane-powered boiler. We also insulated the structural concrete associated with the pool and bunker with sprayed foam and included an extensive drainage system: We did not want frost-heave to move any of the structures we had completed. As I suppose these articles have made clear, remote site construction requires an increased amount of site planning and overall logistical savvy. As we moved along with this project, we were constantly aware that any error in judgment, in material planning, in scheduling deliveries or in managing basic construction processes would be magnified in ways we didn’t want to consider. Even something as simple as garbage removal took on a whole new complexity: All food waste had to be removed from the site daily so as not to attract bears and raccoons. This made short-term sense, of course, but we also had to worry that those creatures would come to see the property as a feeding area in the long run, too. Day and night, the poolscape has charms that draw people from the house and out to the decks, if only to enjoy the view of the lake below, reflections off the pool’s still surface or the flickering flames that bring a unique glow to the space. And lest we forget, there’s a big entertainment space below this level – and it, too, offers its own set of incredible views. On the bright side, we are lucky, now that the project is complete, that most of us only lived a hundred miles or so away in Toronto – close enough that we can now get there and back in a day to address small service issues and make routine repairs. To stay on top of things at a distance, we installed a remote monitoring system for the pool and spa. We handle basic management from our offices, and the client likes the system because it means he can heat up the spa with a phone app as he drives toward the cottage. As a matter of convenience, we also trained a retired local tradesman to handle day-to-day maintenance and cleaning tasks. If all goes well, we stay in Toronto and visit the site for not much more than spring openings and winter closings. All in all, this project went very well indeed. It had a special set of circumstances that made the distance seem longer than it was, but we managed – and were grateful that our cliff wasn’t really far away on some Caribbean island. But come to think of it, the winter weather would’ve been much nicer!